How would you tell Metro riders about upcoming service changes? As we’ve mentioned several times on Nextstop, Metro will be enacting the first phase of Restoration 2010 service changes on June 28. For thousands of Metro customers their usual trip times and connections will change next Monday. If you have a smart phone with a transit planning app or regularly use Google Transit, this may be an easy transition, but many of our customers do not have regular access to the internet or do not use it as a trip planning tool. When more people have access to service change information, it increases the likelihood they can adjust their routines and avoid missed connections. Getting the word out to customers can be a challenge for public transit agencies. We have our spaces in buses for schedules and rider alerts in buses, word of mouth from bus operators, and automated alerts at MetroLink stations. We also have online communication means through the website, blog, Facebook, Twitter and e-newsletter. Hopefully, local media will also pick up on the story and remind readers of the upcoming changes. With a diverse group of people using transit, you need multiple methods of communication. What do you think are some creative and effective ways to reach customers? How would you let riders know about service changes? Where would you post information? Where do you go to find out about schedule changes? Who are some effective community partners that could help us push information out, not only for the June 28 changes but also the more extensive service changes coming on August 30? Creative suggestions are highly welcome. Hopefully we can use your input to let as many people as possible know about the increases in service coming next Monday and the rest of the year. 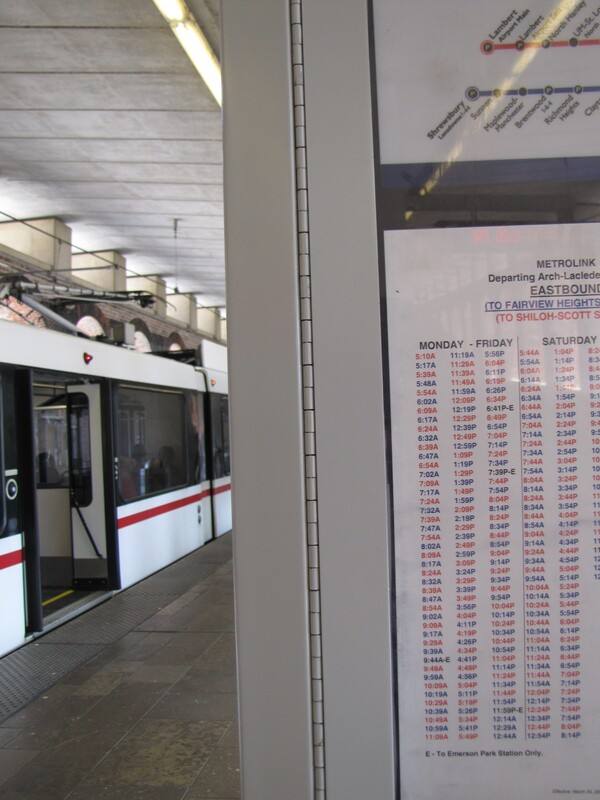 How about a somewhat large paper sign next to the schedules at Metrolink stations with just a simple notice that changes take effect June 28. I don’t think people pay too much attention to the automated alerts, but they frequently check for the next train at the posted schedules – or at least walk by the schedules and would notice the sign. You could also post the signs at the ticket machines. You’ll need to do this in a way that everybody can see. Signs next to ticket machines are a good idea as are signs next to the train schedules, but not everybody rides the train. One thought might be to make a big (removable)decal that goes on the sides of the bus fleet near the front door that simply says service restoration/changes are happening on XYZ date. Riders could then get a flier/ask the driver once onboard. The #90 Hampton will not enter Forest Park Monday through Sunday between the hours of 9am and 7pm due to traffic. Passengers proceeding into Forest Park will need to transfer to the #3 Forest Park Shuttle at the Forest Park Station. Twenty minute rush hour service provided weekdays and additional service provided between Hampton Loop and Catalan Loop seven days a week. This is only the first of two scheduled restoration service changes. August 30 will restore more service, with more changes to route and service coverage. We’ll post proposed changes as they are available. Please tell me that metrolink is not running on a new schedule. I have not received any notification. It will begin running on a new schedule starting June 28. During rush hours, trains will come every 6 minutes instead of 7.5. Thanks Courtney for the info. In response to downtown bus service, there is currently no Sunday service. Part of Metro’s original committment, upon passage of Proposition A, was to eventually restore bus service to the bus stops, where service was discontinued, when Proposition M was defeated. Regular bus service should be restored in the downtown core area east of Tucker Blvd, to give that area of downtown more of a big city downtown feel. I think restoring service to that area is important in the further revitalization of downtown, and making it a more competitive area in our region. Also, prior to the voting of Proposition M, in addition to future service expansion, Metro had also committed themselves to providing service enhancements to bus service at the level which existed at the time, prior to the voting of Prosition M (re: article on St. Louis Region at a Crossroad printed in the Post Dispatch in August or Sept. 2008). Now that Metro has our support in tax dollars, I hope they make good on their committments. To further reiterate my previous comment regarding the service enhancement plan that Metro stated in the Post Dispatch article, Metro had provided a brief outline of how they would enhance bus service with the passage of Prop. M. That plan took a hit when Prop. M was defeated, and the funding to support the planned service enhancement could not be generated. However, with the passage of Prop. A, funding is now available to support the service enhancement plan, as stated in the Post Dispatch article. The defeat of Prop. 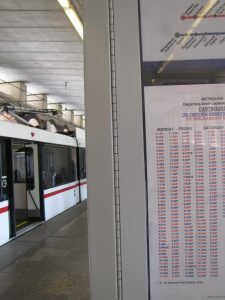 M resulted in cuts in Metrobus service, which resulted in the loss of passenger boardings, because Metrobus service became no longer available to serve those former passengers. The Passage of Prop A, will now generate the funds necessary to eventually restore previously loss service. For starters, the ripple affect of the service cuts now has to be reversed by gradually restoring service back to the same levels which existed prior to the cuts. This will make Metro service available once again for passengers who were affected by the cuts, and hopefully encourage them to return back to using public transit, so that ridership may begin to peak toward the same levels enjoyed by Metro prior to the service cuts. Now that funding will become available as the result of passing Prop. A, after the previous level of service has been restored, I hope that Metro will impliment the plan it had promised in 2008, when campaigning for Prop. M. To win back former riders, and in order to encourage new riders to use public transit, Metro, to a great extent, will probably have to sell itself as well as their their product, in order to regain public trust. The product can sell itself by providing efficient and reliable public transportation. I think the public is tired of campaign promises. They want results. A product will sell itself if the product is good to begin with. Someone said that the #99 downtown trolley is really a wrapped MetroBus rather than something like Eureka Springs, Arkansas has which is really a trolley bus. MIKE, MetroBus route #99 should run on Sunday service and also the #40 as well. I asked Metro about the arrival of the new buses, and I got no answer. I would love to see some arrive. Please assign some to the new #48. I am never a fan of deadheading buses, because when they go out on some portions of thier route just to get to the begining of thier route, it is really a waste of fuel just to run an empty bus out to the begining of a route in order to begin service. Like the #57 Manehster. Once they get to Wildwood or now Manchester and Barrett Station Road, or West County shopping Center, the buses that are deadheading out Manchester Road EMPTY!! And that is a waste of fuel, and the tax payers are paying for that fuel. Currently the Planning Department is looking to split the #57 Manchester service so that the heaviest-use section runs on its own route and shortens the route length. The bus procurement is a work in progress…we can put ourselves on waiting list for brand new buses, lease buses from other agencies, bring older buses back, and looking at smaller, van-like buses. I will let everyone know when we add more new buses to the fleet. That makes good economic sense by getting the most out of their resourses, in addition to the fact that it provides additional service which is made available to potential riders. That’s a great way to encourage and generate new ridership, as well as selling a good product by providng the type of service that is user friendly. Why wasn’t that portion of your comment responded to? The question of deadheading buses is really best answered by our planning department; I’m just unsure of the history and planning decisions in regards to that question. Will get back to you as soon as I can. In Eureka Springs, Arkansas, I see they do have those van like buses. They too have the Chevy Kodiak 4500 truck like bus along with their beautiful Optima trolleys. Sadly, Optima Bus corporation no longer makes those grand looking buses. They seat about the same amount of people as the 2100s do. On second thought, I think that Optima is still building the heritage streetcar. We could see if Eureka Springs Transit doesn’t seem to mind loaning us some of thier Optima trolleys, or Oklahome City has the Opus.